No slider items to show. Please select a group that contains some items! 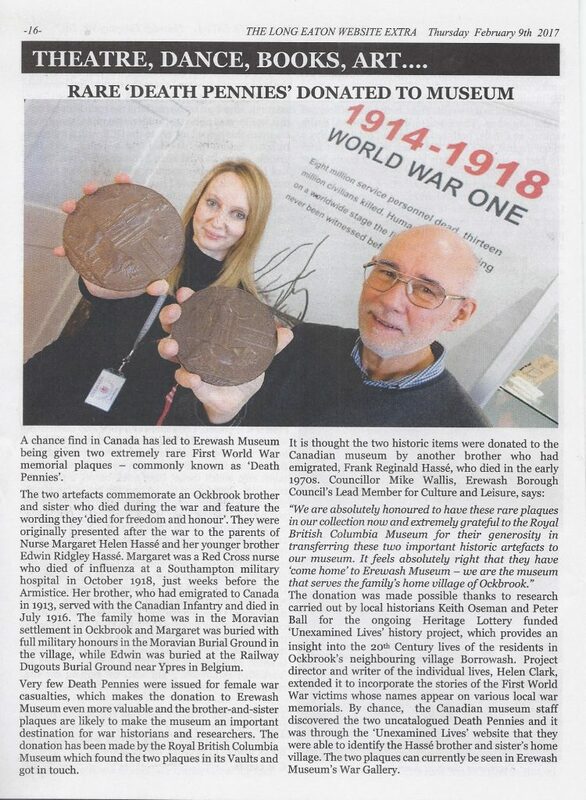 The announcement of the acquisition by Erewash Museum of the Margaret and Edwin Hassé Memorial Plaques (Death Pennies) has received widespread coverage in local media outlets. It was made in a Press Release issued by Erewash Borough Council in January and quickly appeared in the Nottingham Post, Ilkeston Advertiser, Long Eaton Chronicle and Long Eaton Website Extra. An interview with Unexamined Lives’ genealogist Keith Oseman was also played on Ian Skye’s Breakfast Programme on Radio Derby. The Press Release has also been sent to a variety of other publications and organisations. Three genealogy magazines have been informed as well as a number of popular history magazines. The release has also been sent to organisations as diverse as the Imperial War Museum, Derbyshire Archives and the National Archives. 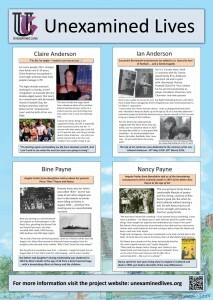 The Commonwealth War Graves Commission has also been informed. It is hoped that the wide distribution of the announcement will stimulate interest with the general public and amongst the specialist history and genealogy communities. 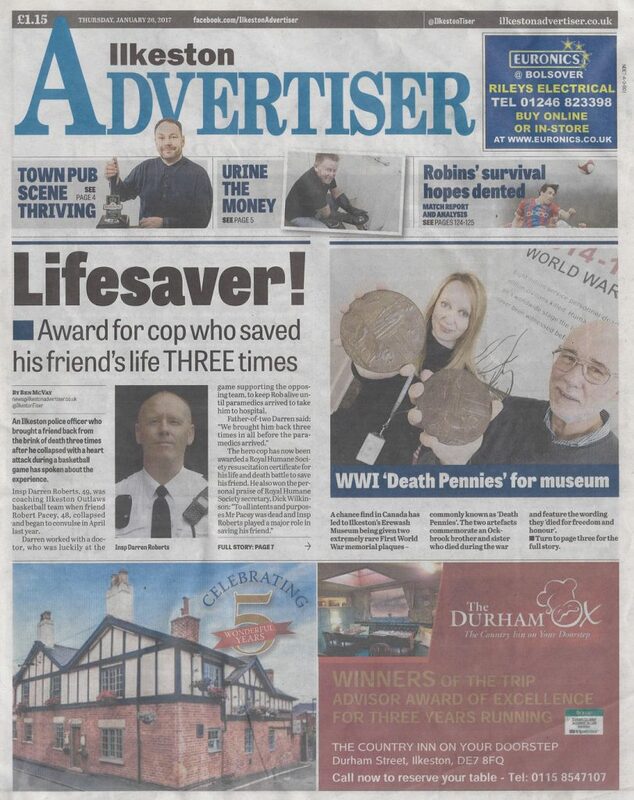 The Ilkeston Advertiser featured the announcement on its front page on January 26th with a more detailed report on Page 3. 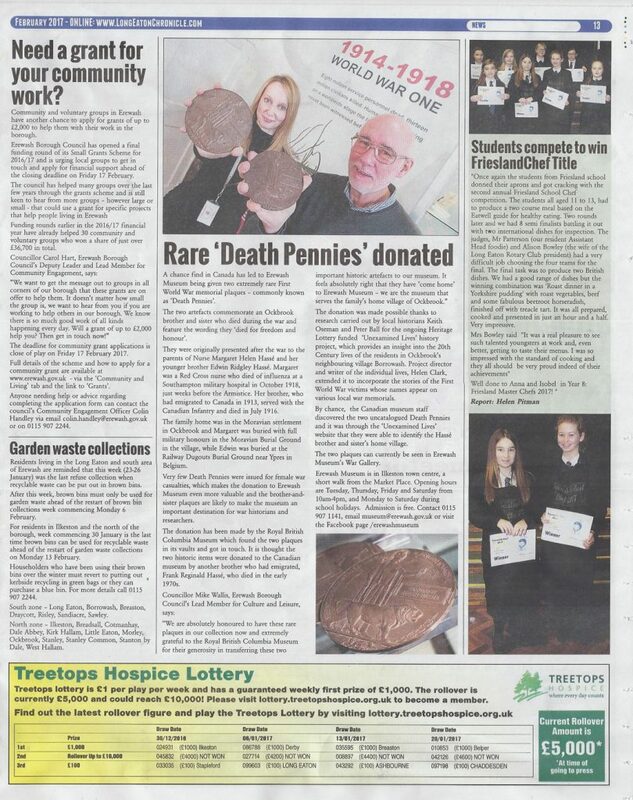 The Long Eaton Chronicle item appeared on Page 13 of the February edition. The Long Eaton Website Extra featured the announcement as a full page feature on page 16 of the February 9th edition. The Unexamined Lives Exhibition at Erewash Museum closed with a Gala Night on 29th November, 2016 which marked the culmination of six years’ work on the Unexamined Lives project. Eric Highton, whose Life can be found on the Unexamined Lives website at “All the World’s a Stage – Eric Highton” has died after a long illness at the Royal Derby Hospital on Tuesday 9th August 2016. He was aged 91 years. His obituary appeared in the Derby Telegraph 30th August, 2016. FRIENDS paid tribute to a staple of local politics who “never really retired”, after he died, aged 91. Eric Highton had many roles including as councillor for Ockbrook Parish Council, a primary school governor – and even a member of pressure group Borrowash Against Gravel. A funeral will take place at the Methodist Church in Borrowash next Monday at 12pm, followed by the burial at Ockbrook and Borrowash Cemetery. Mid Derbyshire Labour branch secretary and former MP Helen Clark said she knew the former Rolls-Royce worker well through their Labour membership. Mrs Clark gave credit to Mr Highton for his suggestion to create a historical project which was later funded by a grant. She said: “Eric suggested the Unexamined Lives project and that turned into a £34,000 project funded by the lottery. “Had Eric not suggested it to me then I wouldn’t have done it.”One of Mr Highton’s preoccupations was that Ockbrook received a lot of attention unlike his home of Borrowash, Mrs Clark said. Eric was first elected to the body that set up Erewash Borough in 1973, representing the Ockbrook and Borrowash Ward, and was a founding member of Erewash Borough Council in 1974. He was elected to the Ockbrook and Borrowash ward several times and represented the Stanley ward from 1995 to 1999. Ockbrook ·Parish Council chairman Mike Wallis said he had only met Mr Highton on two brief occasions but he wished to pay his respects to his services to the council. He said: “We talked a couple of times on various issues about allotments. They weren’t particularly long meetings so I didn’t get a chance to talk very much. This obituary also appears on the Derby Telegraph website – click here. 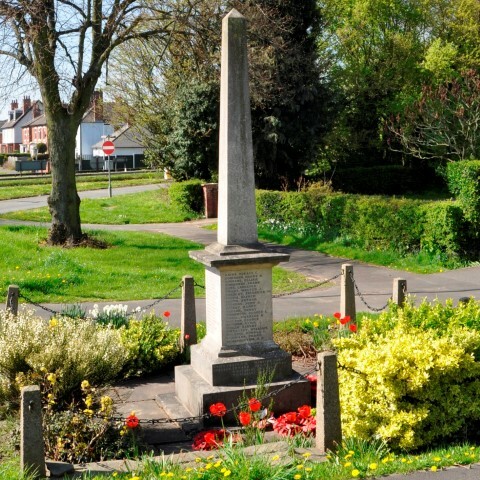 In 2014, much of the work undertaken by the Borrowash Heritage Lottery-funded ‘Unexamined Lives’ project centred upon the War Memorial in the village. Our researchers Keith Oseman and Peter Ball uncovered the histories behind the names on the Memorial and Keith created a ‘Virtual’ First World War Memorial for our site. One person who stood out because she was the only woman to be commemorated on the village Memorial was Margaret Helen Hassé. In the 1911 Census, Margaret (born in 1887) is recorded as living in the Fulneck Moravian settlement near Leeds and working as a music teacher. Margaret’s brother, Edwin who was killed in action on July 12th 1916 is also listed on the Memorial. Margaret’s war was spent nursing in the Voluntary Aid Detachment at Netley, Southampton after training at Ockbrook. She may have nursed the poet Wilfred Owen during his time there. She survived the war, only to succumb to the Spanish ‘flu on 16th October 1918. Margaret Hassé was 31 years old at the time of her death and her name also appears on the Women’s National War Memorial at York Minster. 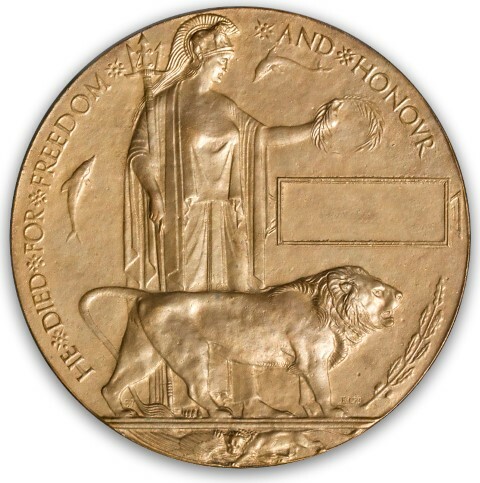 ‘We have come into possession of the Soldier’s ‘penny’ for Margaret and that of her brother, Edwin Ridgeway Hasse. 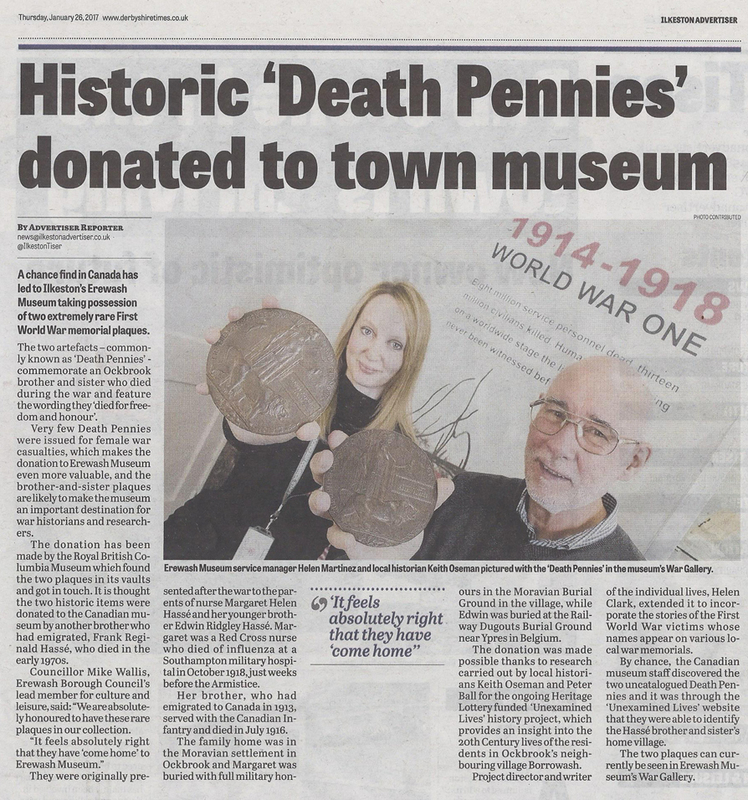 We felt that Erewash Museum, scheduled to host the ‘Unexamined Lives’ exhibition later this year would be a fitting home for the pennies and Helen Martinez, Museum Service Manager at Erewash agreed. It is hoped that they will be there by the time of our exhibition in October/November.